We like our potatoes au gratin recipes to be creamy, cheesy and (if we're honest) easy! This one fits the bill perfectly. Melt butter in medium saucepan on medium-high heat. Add onions; cook 3 min., stirring occasionally. Stir in flour; cook 1 min., stirring constantly. Add milk and red pepper; stir until blended. Bring just to boil, stirring constantly. Simmer on medium-low heat 1 to 2 min. or until thickened, stirring constantly. Remove from heat. 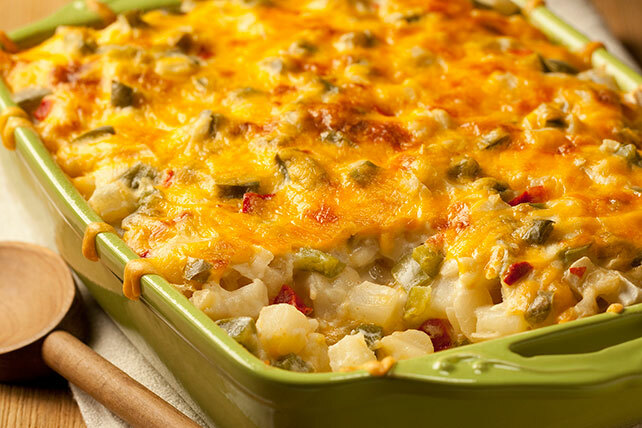 Layer half each of the sauce, potatoes and cheese in shallow casserole sprayed with cooking spray. Repeat layers.